Did you know that even high school students can benefit from a story read aloud? We’ve put together a list of tips for read-alouds in the upper grades. Visit Great Books for more critical-thinking teaching ideas and how-to videos. Most elementary school teachers read aloud to their students as a matter of course. But the practice is less automatic in the older grades. As children grow more independent with their reading, the temptation is to let them do it on their own. While that is great on some levels, there are STRONG reasons to promote reading aloud for all ages. If you are a middle grade or high school teacher, these tips will help you incorporate read-alouds in a meaningful way that will enrich book conversations, deepen understanding, and foster a love of books and learning in your students. 1. 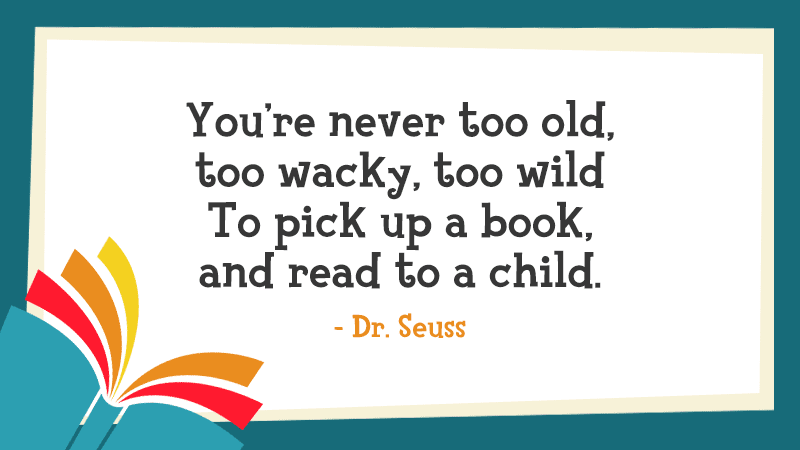 Listen to Dr. Seuss. According to the International Literacy Association, a read-aloud text should engage students at the edge of their speaking vocabulary. Look for text options that are a grade or two above their level. As you read a text aloud, pause to verbalize the internal dialogue going on in your head. Students need to hear what skilled readers do while reading. Then you can have students take turns verbalizing their own internal dialogue to one another. 4. Have students mark the text. As you read aloud, ask students to mark or highlight in their books when they find statements that they agree (A) or disagree (D) with or passages that make sense (MS) or don’t make sense (DMS). Students can then refer back to their notes when looking to defend their ideas about the book. For example, in the video discussion below, students have used letters written onto the text to indicate places in the story where the character feels comfortable (C) and where she feels nervous (N). Their notes from the read-aloud time help guide the later discussion. It may take some time at first for your students to get used to this inquiry approach where the teacher doesn’t have the answer, but pretty soon students will think, “I am an amazing thinker!” The way you respond—never saying “That’s right!” or correcting a response but rather validating their great thoughts—will help build trust and confidence as they feel more and more comfortable thinking creatively and sharing their ideas. During a second reading of the story or excerpt, invite students to role-play the characters. Students will gain practice reading aloud with expression and taking turns acting out different characters in the book. This helps everyone in the class visualize the characters and understand their motivations better. Watch how this teacher uses role playing during his read-aloud activity. It’s great when the books you choose have themes and ideas that are controversial—not in a political or inappropriate way but in a way that leads to open-ended discussions. When you can ask questions that have many possible answers, students feel empowered to share their ideas and opinions. When students can point to some evidence in the text to support their point of view, it bolsters their confidence in defending a position (out loud!) that might be different from those of their classmates. 9. Let them respectfully disagree. Students in the older grades will enjoy agreeing and disagreeing with one another during classroom discussions. Foster that healthy discourse by requiring students to support their different points of view. Have them take turns finding and reading their evidence from the text out loud. Celeste Smith finds that her shy and ELL students are more engaged when they can join in a debate in which there are no mistakes, no wrong ideas. 10. Resist sharing your opinion. When you ask questions during read-aloud discussions, students may think that you are looking for some specific answer. Help them understand that there is no right or wrong answer. Try not to share your ideas because students may mistakenly assume that your way is the right way, which can shut down their own creative thinking. As students offer ideas, acknowledge them—especially when they can support their thinking with evidence in the text—and then encourage the class to continue exploring additional ideas. 12. Use Shared Inquiry to spark creativity. Often when teachers use the Shared Inquiry technique for read-alouds and book discussions, they are amazed at the variety of new ideas that arise from students. Six kids might share six different thoughts about a story and then back up their ideas with evidence from the text. It is exciting to be a teacher in that classroom when your students offer some insight that you hadn’t considered before. It all starts with a question. Learn more about how to teach with Shared Inquiry here. You don’t want to rush a read-aloud. Make sure you have at least 15 or 20 minutes to read the story, passage, poem or informational text with emotion and to invite discussion. Brain science recommends breaking whatever time you have into 10-minute chunks to maximize the attention students can devote to each segment. You could read aloud for 10 minutes, discuss the passage for 10 minutes and then move to a writing exercise for the next 10 minutes. 14. Circle time isn’t just for preschoolers! Seating students in a circle or semicircle works well for a read-aloud and book discussion. That kind of classroom setup encourages students to face and talk to one another—not just to you. 15. Picture books aren’t just for little kids either. “Children’s books should be read to middle and high school students regularly,” says fifth-grade teacher Chris G. from Brooklyn. “One of my favorites is The Giving Tree by Shel Silverstein. There are so many possible interpretations of that book, and my students continue to surprise me with ideas that I hadn’t considered—even though I’ve read the book so many times!” Picture books can also be more accessible to reluctant readers and give fluent readers a chance to dive into themes on a different level. Cross-text activities provide students with opportunities to compare and contrast multiple texts, both thematically and stylistically. Pairing fiction and nonfiction selections together for read-alouds and discussions is particularly effective. 17. Integrate writing into the reading process. When students know they are going to have a chance to prove their ideas in writing, they are more attentive to the read-aloud and discussion. Most kids love to show you that they can support what they believe about the story. 18. Teach good listening skills. The link between reading comprehension and listening is well-researched and documented. One effective strategy employed by teachers who use the Shared Inquiry technique is to offer a focus question that you want students to think about and listen for as you read aloud. A focus question helps them listen carefully for details that support possible answers. Listening to a story is also a great way to reach reluctant or struggling readers. Just listening, for some, can be more enjoyable. Celeste Smith says that her sixth through eighth graders never tire of listening to and reading Money Hungry and The Skin I’m In by Sharon G. Flake. They also enjoy Freak the Mighty by Rodman Philbrick. Here is a list of recommendations from other middle school teachers.